Inspired by the Woodruff Library's exhibit 'With Love' that examines love letters from famous authors and former Emory students, this video looks at how current students express their affections. For those whose Valentine's Day didn't go as well as hoped, epidemiology professor Viola Vaccarino discusses the science behind a "broken heart." 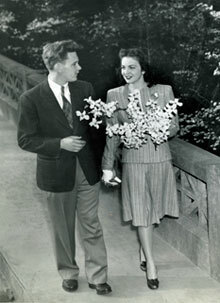 Lynn Hicks and Beverly Burgess, April 1946. Emory University Picture Files, Manuscript, Archives, and Rare Book Library, Emory University. 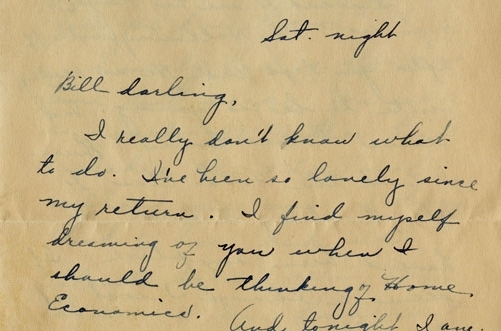 Take a peek into the love letters of famous literary couples – and former Emory University students – in the exhibition “With Love,” running through March 8, 2012 in the Concourse Gallery on Level 2 of Emory’s Robert W. Woodruff Library. The exhibition contains letters, telegrams, poems, book inscriptions and photographs. Curator Sarah Peterson, the outreach coordinator for Emory’s chemistry department who earned her Ph.D. in English at Emory, wrote in her curator’s statement that the materials show a range of emotion, from the passionate outpourings of Emory students to the vibrant expression of Alice Notley, from the pragmatic perspective of Maud Gonne to the wild sentimentality of W.B. Yeats. Peterson solicited ideas for suggested couples from Manuscript, Archives, and Rare Book Library staff members based on their familiarity with the collections. Then she chose specific materials to create a narrative. Letter: Cecile Nicholson to William Levi Dawson, 6 April 1935. William Levi Dawson papers, Manuscript, Archives, and Rare Book Library, Emory University. A handmade red and blue Valentine from Alice Notley to Ted Berrigan, with original poems and collages inside. “I thought it gave a nice sense of the collaborative spirit of their circle of poets, and the way they were influenced by visual artists, as well as the emotional connection between them,” Peterson says. A letter from W.B. Yeats to Maud Gonne. The two were friends for more than 40 years, and Yeats was inspired by and deeply attached to Gonne, Peterson says; he proposed to her four times, but she declined each time. In the letter on display, Yeats pleads with her not to marry John MacBride (she did anyway). Parking is available in the Fishburne and the new Oxford Road decks.